The art of using thread to create a design, telling a story on fabric, using a needle and thread. Embroidery is as old as recorded history and has been found in most cultures. Initially, fine ornamental needlework was only for the wealthy. Embroidery is thought to have originated in China and India. It is believed that Jews learned of this art form while being held captive in Egypt. The early Christian Church became the main vehicle spreading embroidery to the West. Important ceremonies demanded the finest linens and apparels. Weddings, funerals, and the church had the greatest influence on embroidery designs. America added to the art by introducing crewel using home spun yarns. Children were taught embroidery by sewing alphabets, scenes and map drawings by hand. America was the home of the “sampler”. American embroidery was often done on burlap showing folklore and contemporary life. Ladies would come together, relax and visit, while working on their projects. These gatherings were referred to as ‘bees’. A tedious, time consuming and expensive process, it remained only for the rich until the Industrial Revolution when the speed and efficiency of large embroidery machines became available to the general public. Donna first became interested in embroidery when she was eight years old. Her cousins helped her to start a project teaching her the various stitches. Her first completed project was a Holly Hobbies picture, which is displayed in her home. 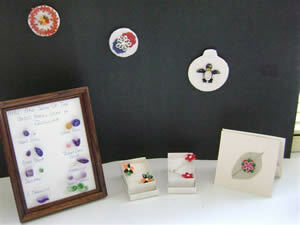 Over the years she has completed approximately 200 handmade items. Ten years ago she opened a commercial embroidery business. She now has a 1,400 pound embroidery machine that can embroider three items at a time at a speed of 1,000 stitches a minute. At full speed 100 items/day can be embroidered. Even though embroidery is now a source of income, she enjoys handwork as a keepsake and a pastime. She is presently completing a sampler that her husband's grandmother started but was unable to finish. This too will be proudly displayed in her home once it is completed. Probably one of the oldest of the arts as woven mats have been discovered in the homes of cavemen. This craft today takes advantage of a more modern means of weaving. Marlene will be demonstrating weaving on a 4-Harness Loom. She became interested in weaving after attending a Gilford Middle High School Christmas craft fair and purchasing a weaving. After two years of admiring it she called the weaver asking to be taught. The woman agreed and lessons were given for a few months. She then started weaving on her own (a fast learner)! She enjoys weaving intricate patterns and is fascinated by the interplay of the colors. Different textures of yarns combined with the various colors and patterns give the opportunity for her to be very creative. She weaves chenille scarves for two shops, gifts for family and friends and items for her 1780 cape. She also weaves overshot patterns in the style of the 1700s making bureau scarves, runners, curtains and pillow tops. Dish wipers, pot holders, blouses and rag rugs are also created. This ancient art first appeared during the 15th century. It was then known as “paper filigree” and “rolled paper work”. Two centuries later, the adept nuns of Italy elaborated on the simple beginnings and made an embroidery-like array of miniature scrolls and paper rolls. Their agile fingers quickly wrapped wisps of paper around bare bird quills. That is how the art eventually took its name of Quilling. The nuns’ labor of love resulted in unique quilling designs and shapes which were carefully used to decorate sacred relics and plaques. Eventually the art of quilling spread first to France and England, and finally appeared in the colonies of America. Examples of pre-Revolutionary War pieces of quilling can be seen on display in the Metropolitan Museum of Art in New York City. The paper strips used today are usually 1/8” wide of various colors and lengths. Lynda will be exhibiting and demonstrating this craft. Having enjoyed this labor- intensive craft for many years her expertise is unquestioned. An upcoming article concerning the Heritage Arts Day will include discussion of a few more of these wonderful old-fashioned crafts. Gilford’s Thompson-Ames Historical Society welcomes comments on, or suggestions for articles. You can reach us at Thomames@worldpath.net and visit our web site at gilfordhistoreicalsociety.org.